Artwork details: gouache, some coloured pencil, 6 x 6 inches (15 x 15 cm), 2004. The Tattooed Fairy was the first miniature painting I did - in fact the miniature size of the painting happened rather by accident: I had promised to try to have a painting demonstration set up, and with only a handful of days to go had to come up with something pretty quickly, and get it to a stage where I could demonstrate something worth seeing. So I decided the size of the painting would be small, in order to have a chance to get it to a half-finished stage; a 'fairy portrait' seemed a good choice as it would be relatively simple; and I'd rather liked the idea of a fairy not only with tattoos, but body-piercing and wing-piercing as well. In the end I found that although I had chosen 6 inches square as a deliberately small size for my painting, I was surprised at the amount of detail I could fit in. I made the fairy fill most of the space, leaving little room for background - but what was interesting was that the remaining spaces around the fairy could be filled with very precise detail until there was literally no empty space left. Since the Tattooed Fairy, I have painted a lot more miniatures. They actually take barely less time than the larger paintings since I fill them with detail, but it's a format I like a lot. One more thing - since the Tattooed Fairy was originally intended as a demonstration painting I have a complete set of photographs showing the painting of it from start to finish in the 'info' section. 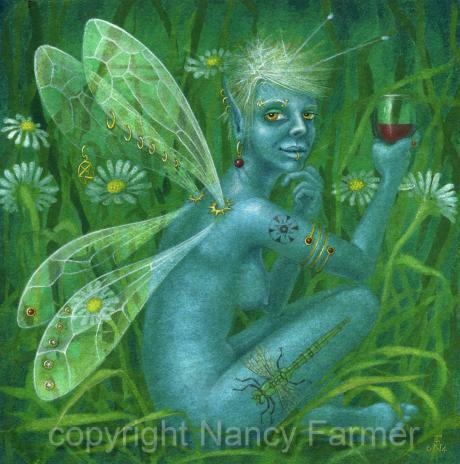 Click here to see the step-by-step photos of the Tattooed Fairy painting. Nowadays I do a lot of paintings like this - with the one exception that for the Tattooed Fairy I used a little pencil to add the finishing touches - usually now I try to stick only to gouache paint, simply for the sake of purity.